Understory plants grow beneath areas of continuous coverage provided by tree canopies. The plants that thrive in this environment require little sunlight, preferring moist and humid shady conditions in well-drained soil. An understory of plants occurs naturally in rain forests and other forested areas. Homeowners with areas of heavy shade can take advantage of understory plants to create a peaceful and visually pleasing retreat using a variety of shade-tolerant plants. Hostas represent the most popular understory plant for shady areas in the landscape. 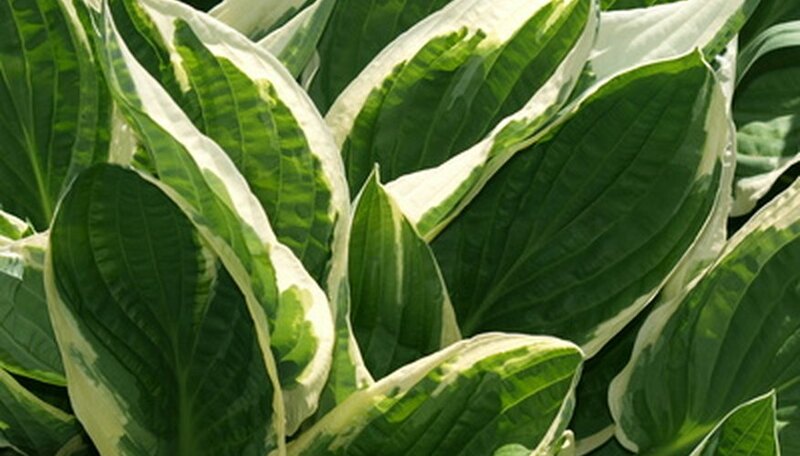 There are hundreds of varieties of hostas, including ones with variegated, light- or dark-green and even blue leaves. Hostas grow in hardiness zones 3 through 9. The plants grow slowly and propagate by division. Most garden hostas come from hybrid varieties ranging in size from 6 inches to 3 feet tall. Some hostas flower in spring with pink, mauve or white blooms. A hardy perennial, hostas came originally from China and Japan. Because of the differences in color, size and texture, several varieties of hosta can grow in organized groups to cover an entire understory with plants. Recommended varieties of hosta include “Great Expectations,” with blue-green leaves that have a large yellow blotch in the center, “Halcyon,” with powder-blue leaves that turn green in summer and “Sum and Substance,” with golden-yellow leaves and lavender flowers. Nicotiana, a member of the tobacco plant family, flowers prolifically in white, pink or light green, with flowers lasting two to three months. Nicotiana, or flowering tobacco plant, performs as an annual in the North and as a perennial in the South. They grow 2 to 3 feet tall and prefer a bit of filtered sunlight, even though they grow well in an understory. Not always available as transplants, select nicotiana seeds from a catalog and start plants indoors for spring transplanting. Recommended as a shade or understory shrub by the University of Maryland, Rosebay rhododendron grows slowly with evergreen foliage. Also known as great laurel, Rosebay rhododendron grows in hardiness zones 3 to 7. This plant does better in the eastern United States, with its higher humidity, than in the drier western states. The shrub grows 4 to 15 feet tall, depending on variety, with large blooms ranging from purplish-pink to white. Popular with hummingbirds and butterflies, Rosebay rhododendron grows best in moist, well-drained soil. These flowering plants grow wild in the understory of the Great Smoky Mountains National Park.